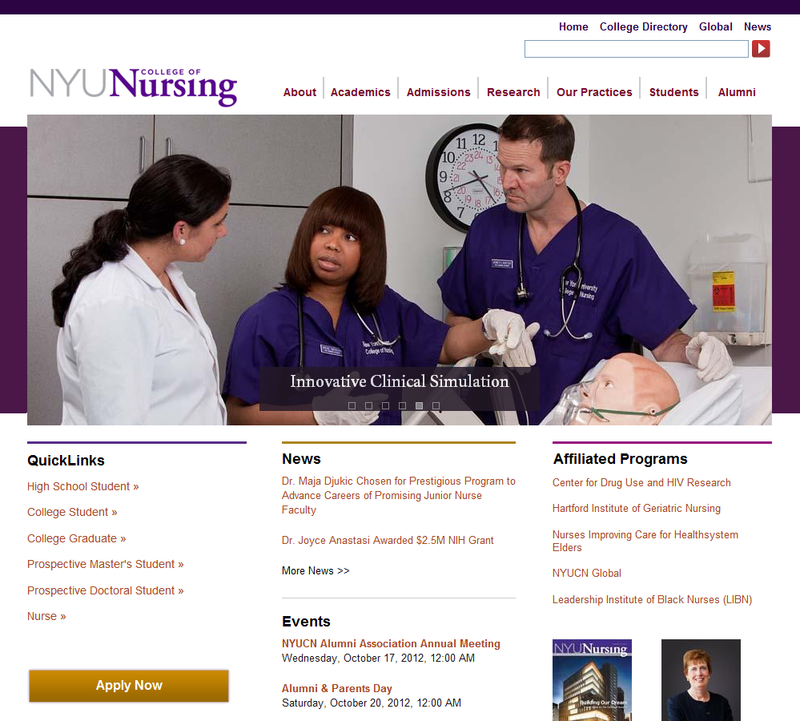 New York University College of Nursing (NYUCN) is a leading academic center for education, research, and training in nursing. To advance its core mission and provide resources to connect more effectively with target audiences, from prospective undergraduates, graduate students, faculty and researchers to alumni and those interested in the faculty practice, the College needed to upgrade its Website. It worked with DPCI and a design agency to redesign the Website and implement new content technology to simplify the Web publishing process. The goal of the redesigned Website was to better position the center as a leading training program and vital intellectual center, at the forefront of education, research, and clinical practice. The existing NYUCN Website contained mostly static HTML pages and the process for publishing and updating content was cumbersome, time-consuming and required technical knowledge of HTML. The College also believed that a more visually appealing and easier to navigate Website would help to attract prospective students, faculty, and researchers, engage alumni to participate in activities offered at the College and increase alumni donations. DPCI recommended Drupal version 6, an open source Web content management system, to meet NYUCN’s needs. 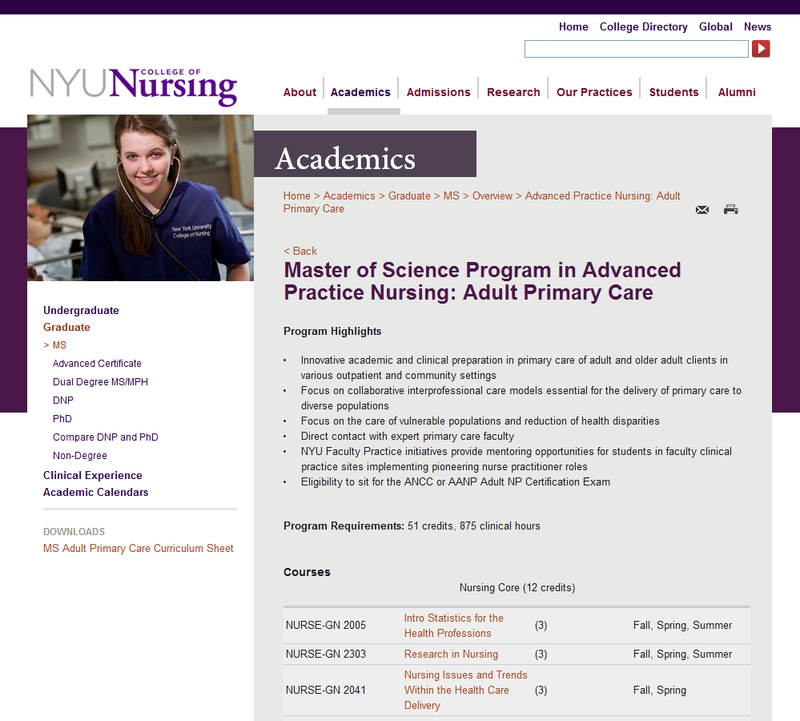 With Drupal, authorized NYUCN staff members can publish content, create events and update faculty profile pages, without technical Web-editing expertise. The College first worked with the design agency on the concept and design for the new Website. Then, using the wireframes and design comps delivered by the design agency, DPCI created solution requirements then provided Drupal consulting services to build NYUCN's new website. Once the solution requirements were validated and approved by NYUCN stakeholders, DPCI translated the requirements into technical specifications including system architecture, identification of core and contributed Drupal modules, custom module development, user roles and permissions, content types, blocks and views. Next, DPCI’s Drupal development team followed the technical specifications to build the new NYUCN Website, integrating the design agency’s designs with the Drupal Web content management system. DPCI created content types in Drupal to support a range of content, including courses, faculty profiles, events, publications, research projects, and news. All academic course information is now entered and managed by NYUCN staff within Drupal instead of in Microsoft Excel spreadsheets. DPCI configured blocks for each section landing page to showcase recent news and upcoming events. DPCI then customized Drupal user roles and permissions to allow section editors to only edit content in their Website sections and promote specific events or news items to their section landing page. DPCI also configured permissions so that content created, edited and promoted by users remains in an unpublished state and in a moderated content queue for review and approval by an editor or administrator. For event registration, DPCI implemented several form templates using the Drupal Webform module for different event types. Each time a new event of a particular type is created, an event-specific registration form is also created for the event. 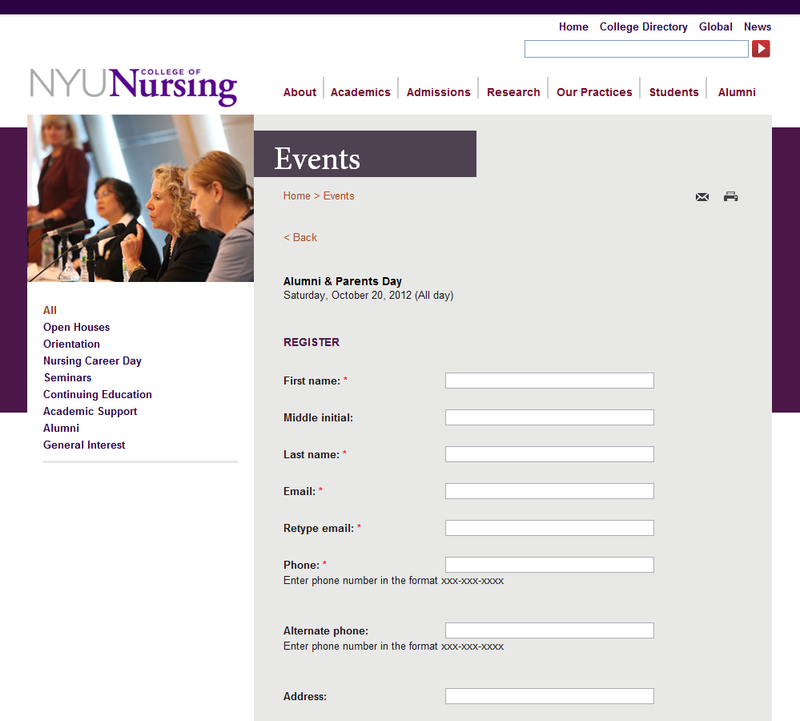 This allows NYUCN staff to capture information from registrants only relevant to the specific type of event. At any time during the registration process, authorized staff members can export the registration data from Drupal. In addition, DPCI integrated Drupal with Google site search using the Google Custom Search Engine module, and implemented specialized search functionality to allow visitors to find research projects, publications and scholarships on the Website with ease. The result is a Website that is more visually appealing to NYUCN’s core audiences and is easier to navigate and access a variety of content, including admissions and course information, videos, publications, press, and events. The College now has a dynamic, visually appealing Website to showcase its research, faculty, activities and academic programs and deliver all types of compelling content to its target audiences. By tailoring the Drupal Web content management system to NYUCN’s needs, authorized staff members now have control of the Website's maintenance, including content updates and event management, without needing technical expertise in HTML. Visitors can easily navigate the broad range of content, search for specific research projects, publications and faculty members, and register for the many events and activities offered by the College. The new Website reflects the exciting range of activities at the College and serves as a resource for career development and collaboration among students, faculty, researchers and alumni.